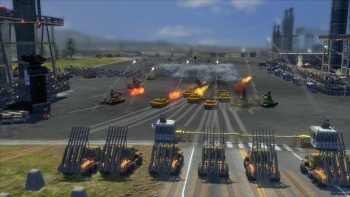 Last year, we learned that Petroglyph Studios - a developer formed from the remnants of Command & Conquer creators Westwood - was working on an MMORTS under the wing of MMOG publisher Trion. Last week, we saw the game - now titled End of Nations - in action. End of Nations takes place in the not-too-distant future, where skyrocketing prices of fuel and food lead to civilization crumbling into anarchy. The anarchy and civil war is finally curbed by the introduction of a powerful new organization calling itself the Order of Nations - but as it turns out, the Order of Nations is actually an evil, totalitarian state, and individual armies and commanders must band together to break its iron fist of control. That's where you come in, by the way. My initial thought upon the unveiling of End of Nations was that it would be a "psuedo-MMOG" of sorts, where individual skirmishes and matches might influence a larger world map - but only a few people would actually be playing together at any one time - but as it turns out, I was wrong. The game world is persistent, said Senior Producer Ted Morris during a gameplay demo, and showed us some examples. When a player logs in, they're brought to a War Room screen showing a map of the earth with all the "hot spots" of conflict immediately visible, as well as the in-game locations of all of their friends. A particularly cool feature, explained Morris and Producer Jeff Jirsa, was the scrolling "news ticker" at the bottom of the screen that would be updated with important events in the world of End of Nations. For instance, if you and your friends managed to defeat a terrifying Order of Nations Panzer Hulk - imagine a giant battleship tank - the news ticker might trumpet your accomplishments. At the moment, though, we saw that there was a great deal of conflict in Magadan, a map set in Russia, and so that was where they took us. The Magadan map is a "social instance," akin to the overworld in most other MMOGs - and what was absolutely striking about it was its size: It had an area of 20 square miles, and was able to support at least 51 players simultaneously. That odd-seeming figure of 51 wasn't even the cap, we were told - it was limited only by the amount of people Petroglyph had available to log on at any one time.